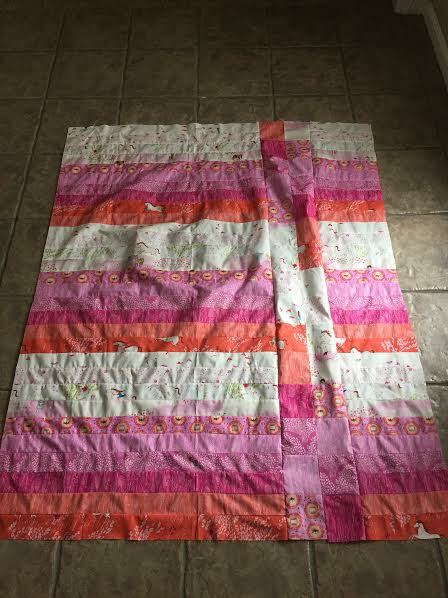 I don’t have time to make complicated quilts so I have a tendancy to try and make them as fast and as easy as possible while still making them gorgeous and practical. About a month ago I let my little 4 year old Kennedy join me at work and pick out her favorite fabric. She fell in love with Wee Wander by Sarah Jane. 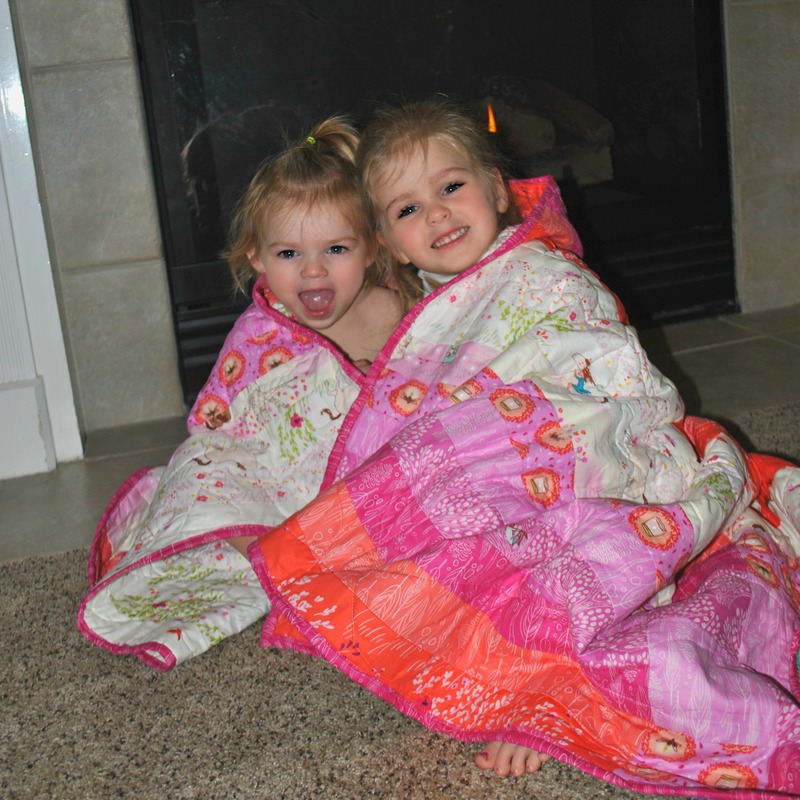 We went on Pinterest and tried to find a quilt pattern she would like and soon came up with this idea. 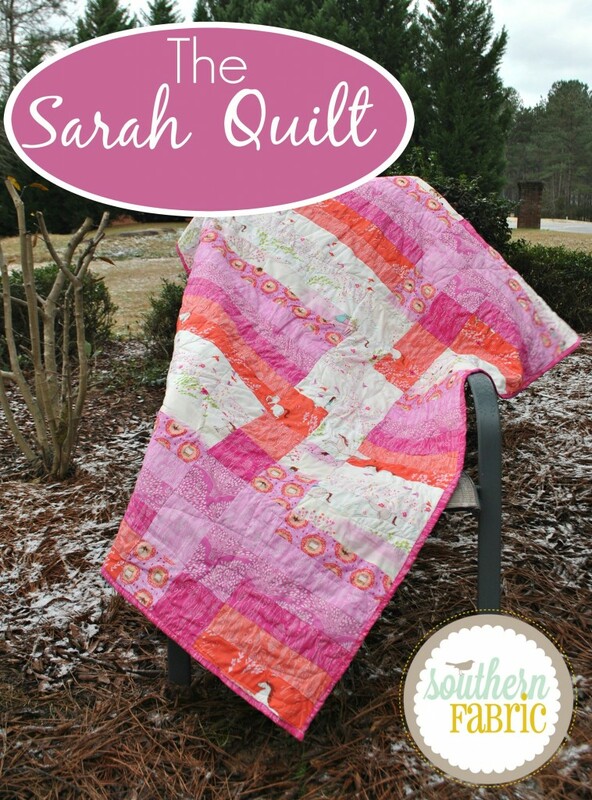 This quilt is so simple that even a beginner can make this quilt. 30 – 2 1/2″ x 44″ strips. We used 3 Wee Wander, Sunrise Jelly Rolls. 30 – 5″x5″ squares. We used 2 Wee Wander, Sunrise Charm Packs. You will have 10 5″x5″ squares left over. In the Wee Wander, Sunrise collection there are 10 different prints. 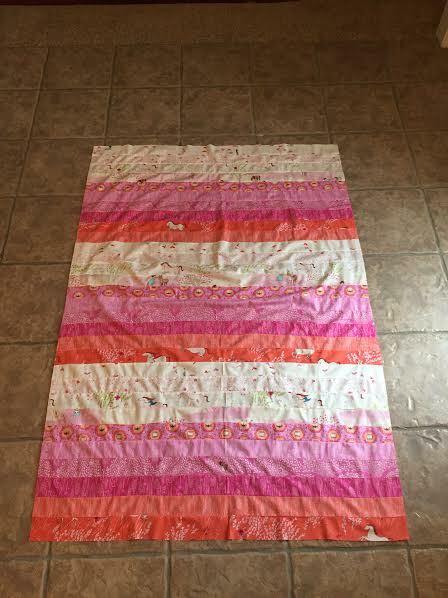 We layed out our 2 1/2″ strips x 44″ strips and sewed all 10 together in a rainbow fashion. We then did this two more times for a total of 30 strips. HUGE TIP! 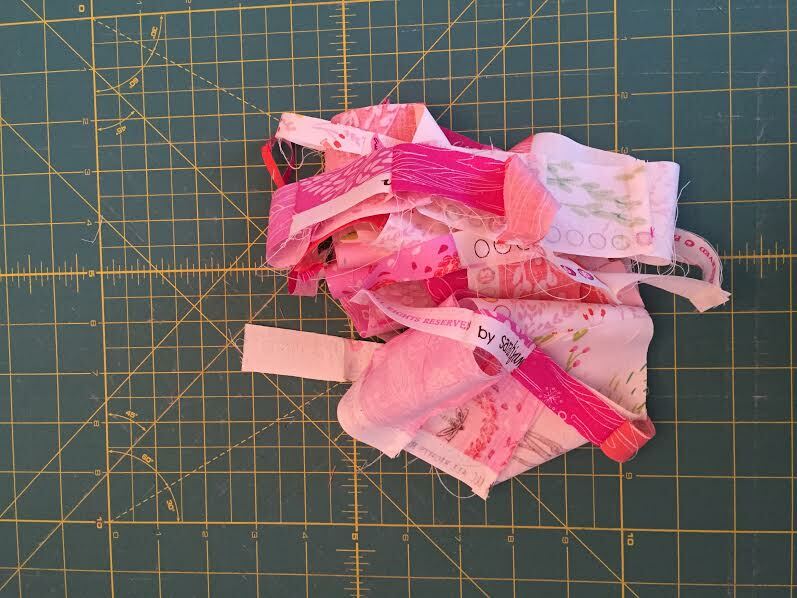 My sweet sister in law and mother in law taught me years ago to never sew your strips in the same direction over and over again because it will make the fabric start to no longer lay flat. I obviously did not listen to them and you can see in the picture above there was a lot of puckering all over the quilt rather than laying flat. 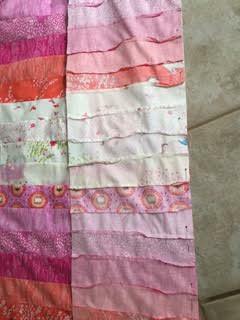 How to solve this is always sew your strips in different directions and shown in the picture below. Next take your fabric and square it up. You will have a lot of edges hanging over the side and this will need to be even. Next get your 5″x5″ squares out. We used two Wee Wander, Sunrise 5″x5″ charm packs with 20 pieces in each. You will only need 305″x5″ squares and will have 10 left over. Sew 15 of them together in the same rainbow fashion and then do this again making two strips. However, with the second strip start the rainbow with a different color so that the same colors do not line up with each other. 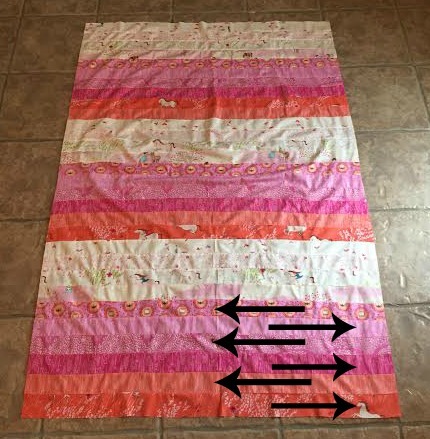 Sew your two strip together. 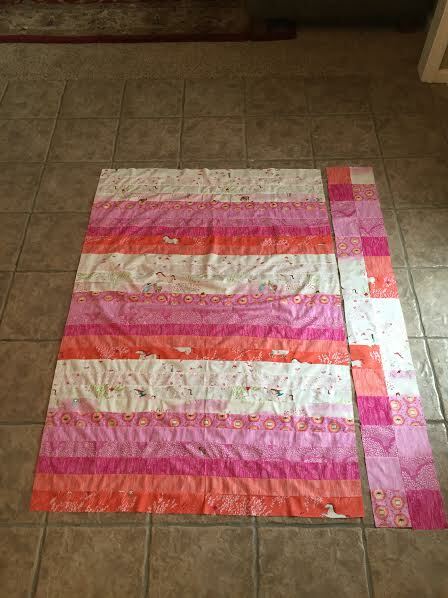 Measure your 44″ strip quilt out 10″ and cut all of the way down. 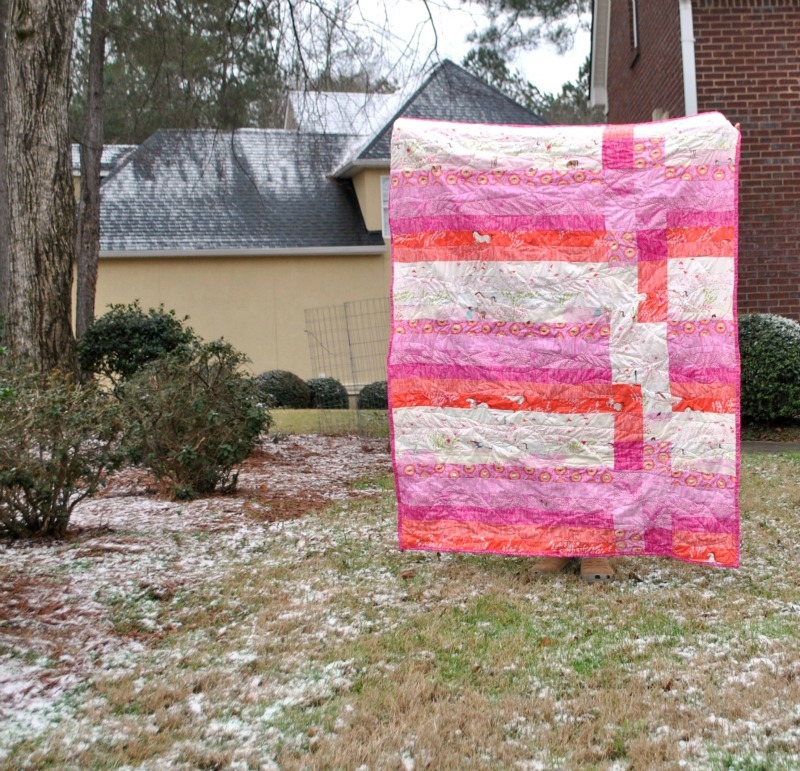 Insert your 10″ strip and sew quilt together. Before you sew together line up your seams and pin to make sure everything will be lined up when you sew. 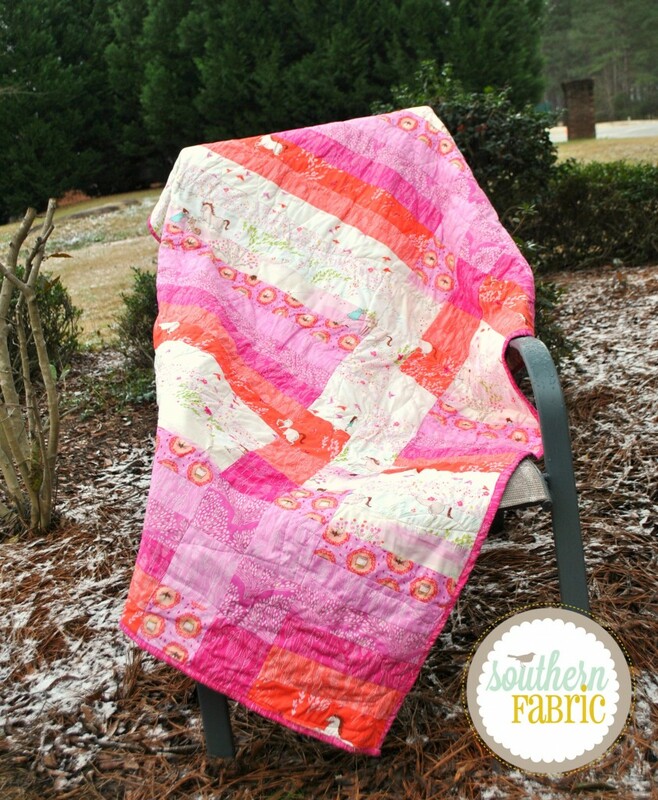 Such a cheerful, colorful quilt! Love the simplicity of it. Great idea for charity quilts too. Thanks much for sharing! how does the back of the quilt look? do we need backing fabric? how much? and what batting did you use? thank you!